This is my mom’s recipe. Its been 5 years since I have moved to the US. 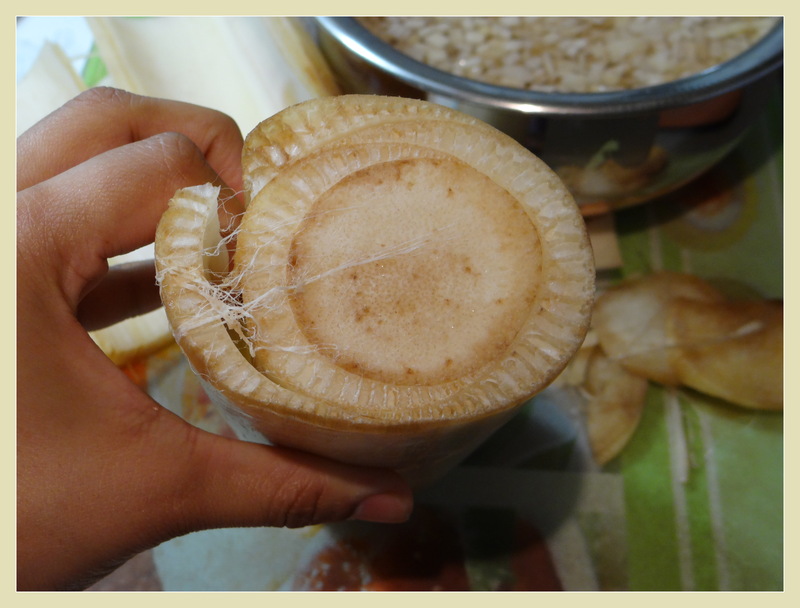 In these 5 years, I finally spotted this Plantain stem (Vazhaithandu) in an Indian Grocery store. I was so excited to see this amazing vegetable, which instantly made me nostalgic, as it reminded me of my mother making this amazing curry during my childhood, that I have missed for so long. I thought I should give this a shot. 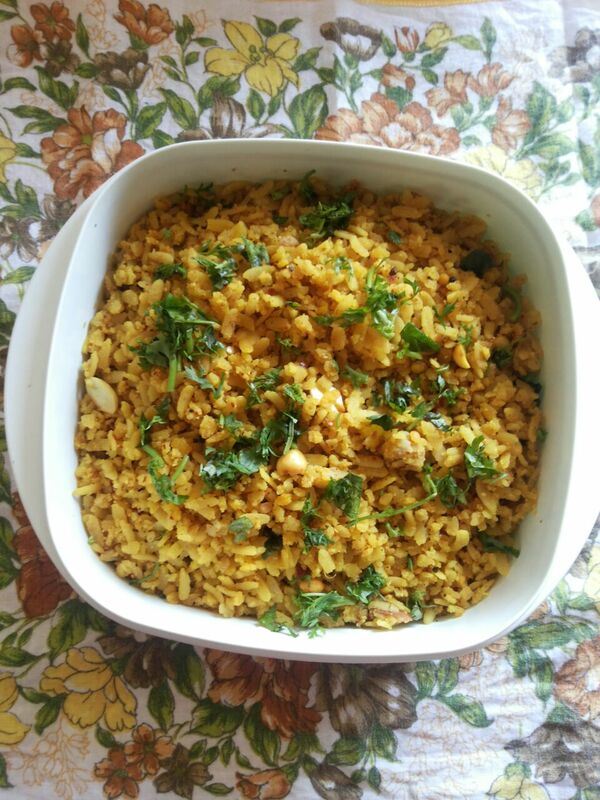 I immediately called her, noted the recipe and here it is, I share with you all, one of my mom’s best recipes in my own kitchen. It helps to prevent constipation, heal stomach cramps and good for kidney stones. It reduces acidity and aids weight loss. It helps fight diabetes, Urinary tract infection (UTI) and stomach ulcers. It is rich in fiber, potassium and various other nutrients. Try out this recipe and get benefited from this amazing gift of Mother nature. 1. To make the Plantain stem curry, in a big bowl add 2 cups of water, some salt and 2 tablespoon curd and keep aside. 2. 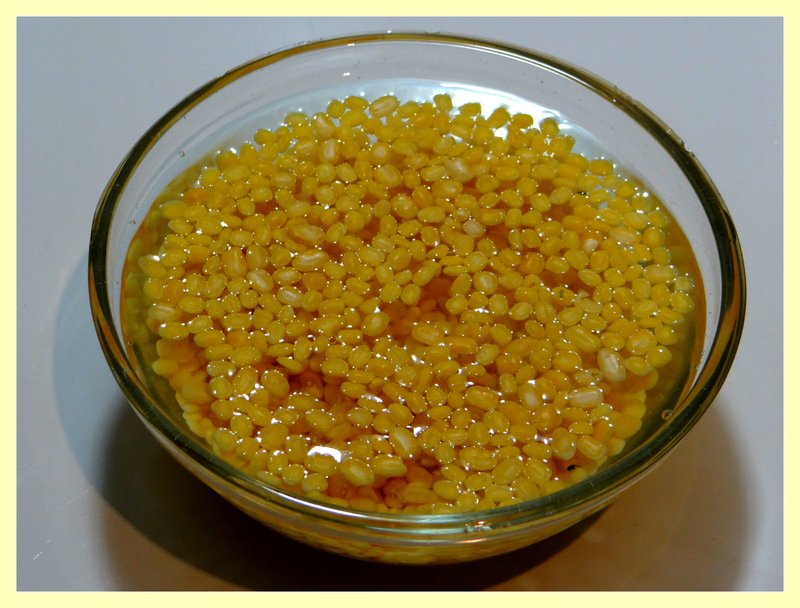 Soak the yellow moong dal in 1 cup water and keep aside. 3. 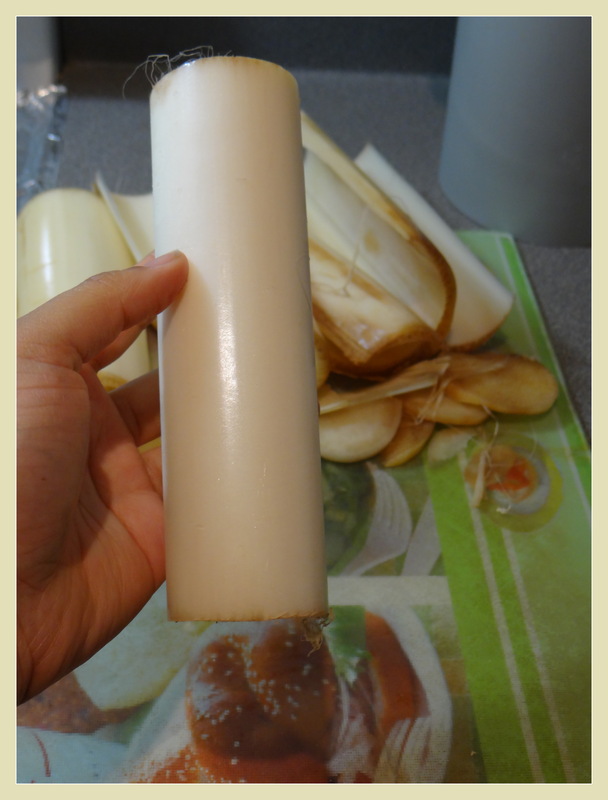 Now, remove the outer ring of the stem as shown in the picture; so that there are no more rings left to be removed. 4. Then slice thinly into discs. 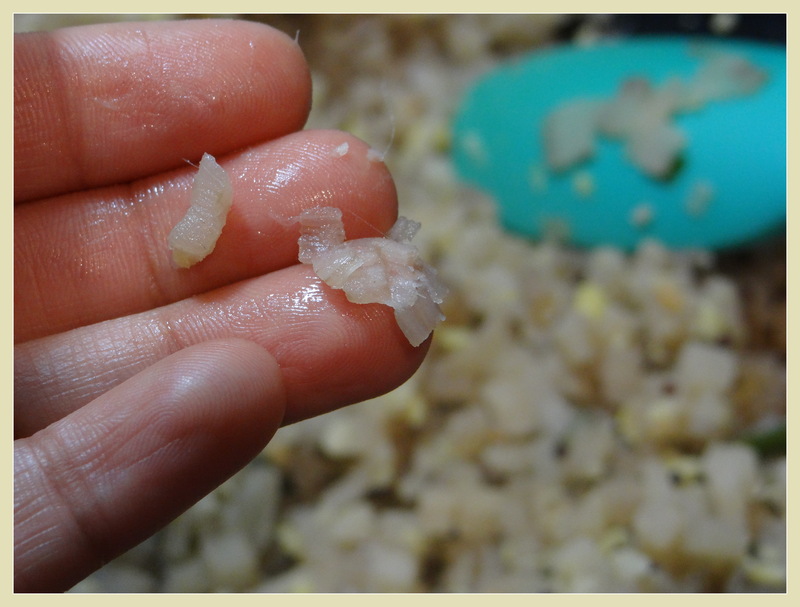 Remove the fiber from the sliced disc by rotating your finger over the slice in a circular motion. Do same for all the remaining slices. 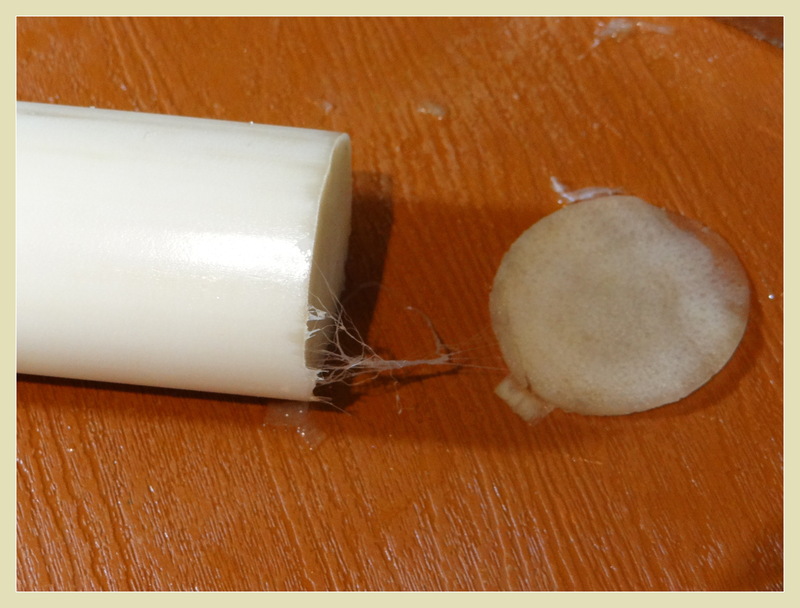 At first it is little difficult to remove the fiber, but trust me in a matter of minutes the job is done. 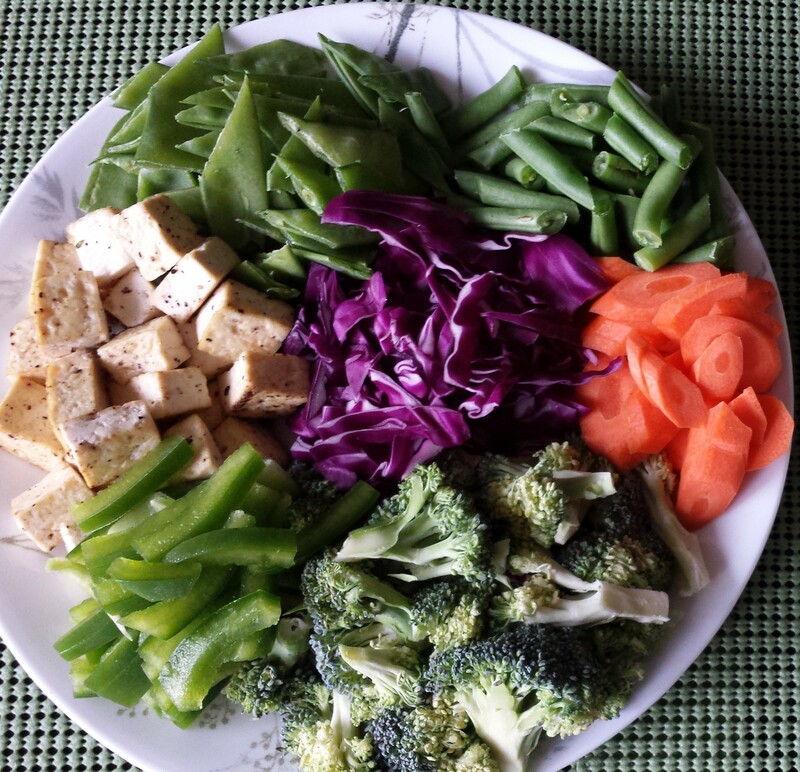 Usually, the tender stems do not have much fiber. 5. 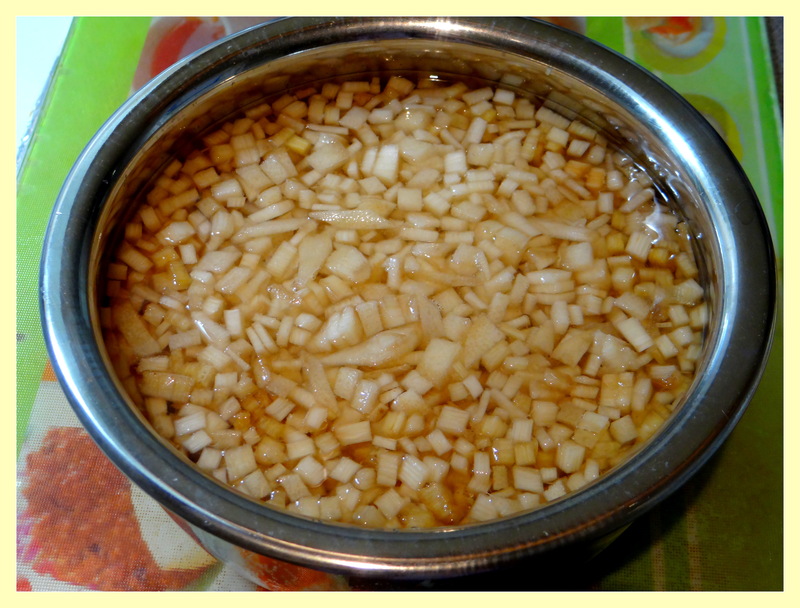 Cut the slices into small pieces and immediately put them in the curd water mixture. 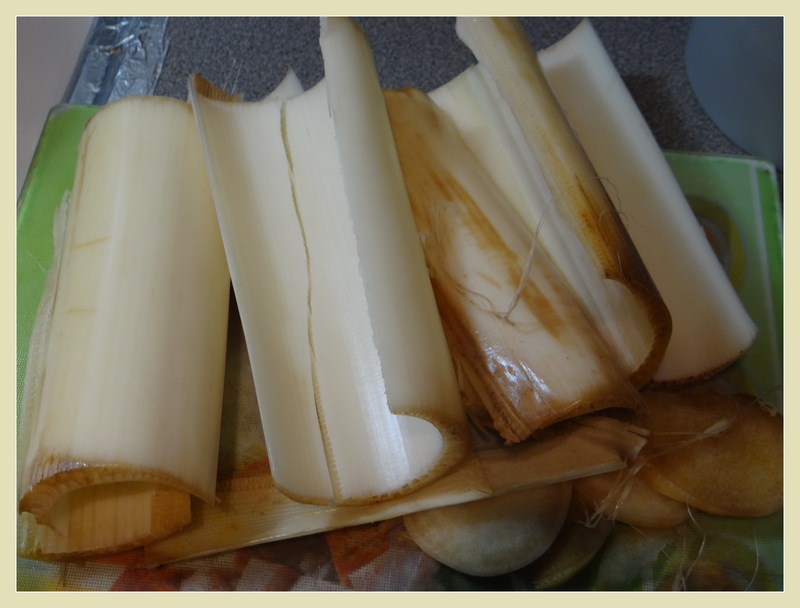 The reason for doing this is to avoid the plantain stems to discolor. Soak for 10 minutes. 6. Drain the water completely from the plantain stem and moong dal. Do not throw the plantain stem water. 7. 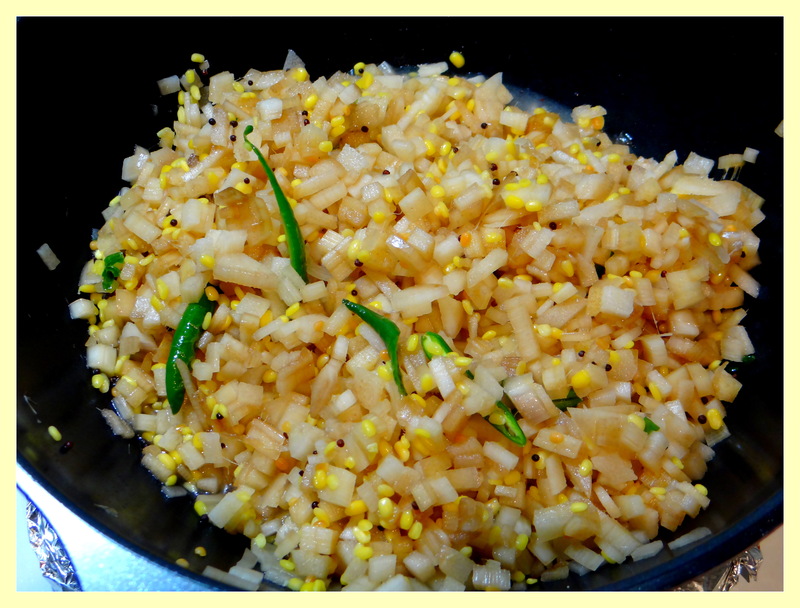 In a kadai / deep bottom pan add coconut oil and when the oil is hot add the mustard seeds, urad dal and asafoetida /hing. 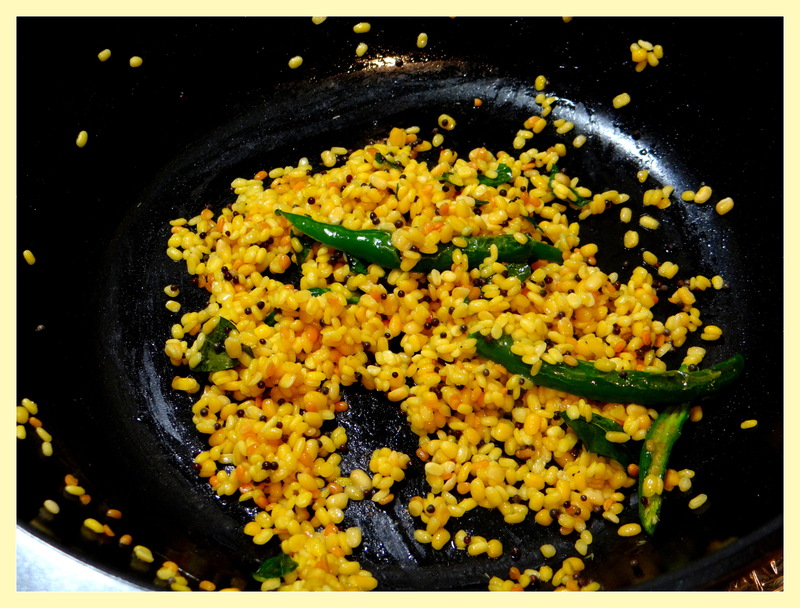 When the mustard seeds crackle, add the curry leaves and green chillies. 8. 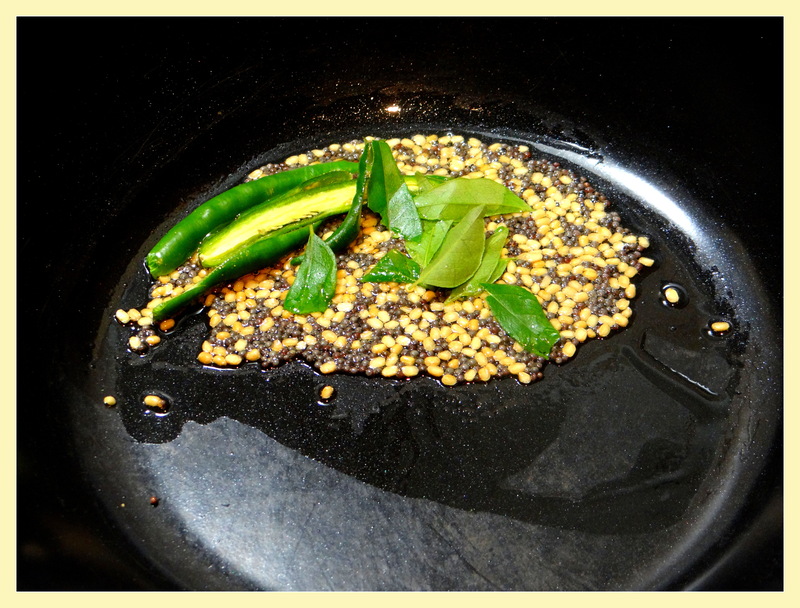 Now, add the moong dal and chopped plantain stem to the kadai. Add little salt (remember we had soaked the plantain stem in curd and salt water) You can sprinkle the reserved water for cooking the stem if needed. Cook for 8 to 10 minutes. 9. You will notice that it has become transparent after it gets cooked and can be smashed easily. 10. Lastly add the grated coconut. Mix well and put off the flame. 11. 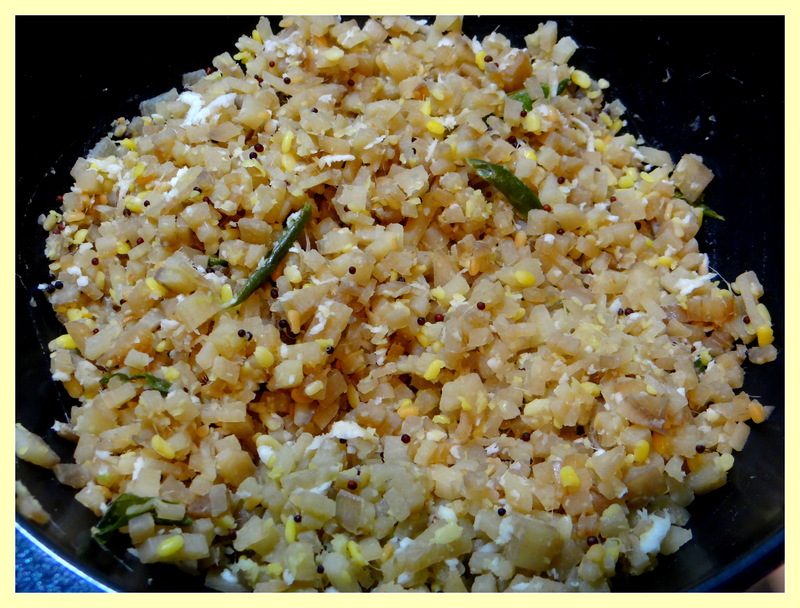 Serve hot as a side dish to rice, more kuzhambu (buttermilk kadi), rasam or just by itself. Enjoy!!!! How to select the right plantain stem: Ensure that the plantain stem is firm and fresh. It usually is pinkish whitish to off white color. 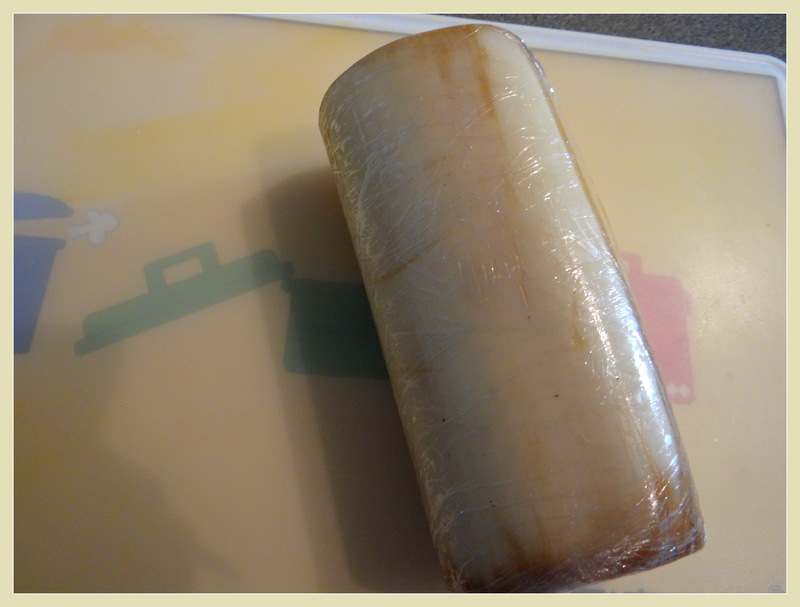 The thicker the outer stem, the tender it will be inside. Roast all the masala ingredients in 1 tsp oil and grind it to a fine powder consistency and keep aside.Now, wash the poha and strain it well and add the tamarind pulp,salt,the dry masala and mix it well.Then in a deep pan/kadai , take oil for tempering and add mustard seeds,hing,channa dal, groundnuts , urad dal and curry leaves. 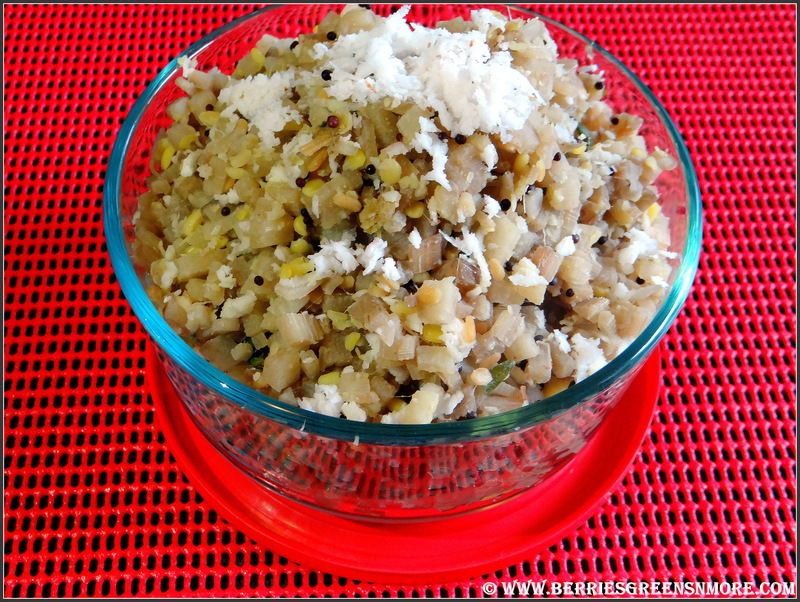 When the seeds crackle add the poha, jaggery and adjust the salt and mix well.Garnish with some coriander leaves.Now enjoy your dish.